My name is Chris, and I'm the general manager for Angelfire and Tripod. As some of you are aware, FTP is currently unavailable. I wanted to explain what's happened, why, and what we're doing next. Angelfire was hit by denial of service attack early yesterday morning. Thanks to security measures we have in place, no member accounts were violated, and no Angelfire sites were harmed. However, the force of the attack did cause us to take certain parts of Angelfire offline, including FTP, which was the main focus of the attack. We've been working through the night, and will continue working today, to restore full service to everyone. Thank you for your patience as we restore service, and for your patronage. As soon as we have an ETA on restoring full service, we will let you know. To better supplement any current themes you may have, we have included a new picture add-on called Picapp. With Picapp, you can select a search term which grabs up to eight images, depending what section of your website you place the add-on in, and inserts them into a stream. Click on any of the images to browse through additional similar pictures and even share your favorites with your friends through different sharing options. So if you have a site dedicated to fashion or even baked goods, use this add-on to dress up your page. Picapp will store your search terms so if you delete one off of your page and want to use it again, you can place your Picapp add-on back on your website and choose to add a new gallery or choose from existing galleries. 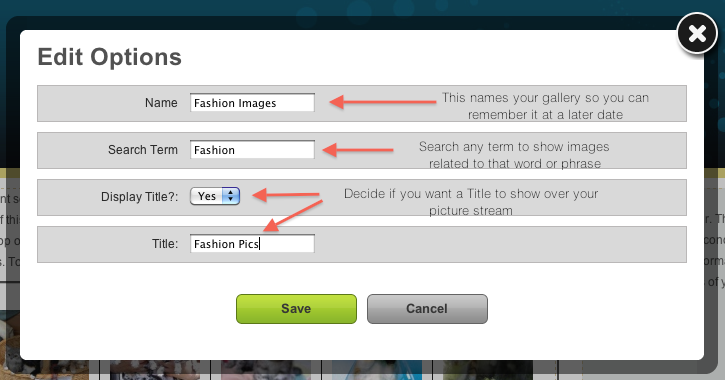 To make this process easier, be sure to name your galleries so you remember what images each gallery holds. Our Designers and Software Engineers have been working hard behind the scenes for months to get this new version done. I’m sure you can tell by the new design that we’re determined to keep Angelfire a fun and easy place to build and host your website. With this release we’ve also become a lot more integrated with Social Media. We’d love you to join us on Facebook for news, tips, web-building advice, and a host of other topics interesting and useful to site builders. Or follow us on Twitter for condensed versions of same. We will post regularly here in the Angelfire Team Blog to keep you updated on our progress with various improvement projects and upgrades. You will also find us hanging out and answering questions in the Angelfire Club a lot more. We’ve paid special attention to the redesign of the Angelfire Control Panel and we hope you’ll find it user-friendly and intuitive. You’ll find your quotas, traffic stats, and add-on options are all easily located. As the months go on we’ll be bringing you a host of new add-on products and services which will also be easily available right from within your Control Panel. Angelfire has been around for almost 15 years and we’re greatly looking forward to the next 15. This ain’t your grandpappy’s Angelfire. This is Angelfire 2010!